We've seen when a method is decorated with the annotation @NotifyChange(), upon its execution completes, the Binder would be informed of the VM property's changes so that Binder can update the corresponding UI accordingly. In this post, whilst we implement the functionality of item deletion in our inventory, we'll see how we can update UI components programmatically at runtime. Build a delete function to our simple inventory CRUD feature. String str = "The item with name \""
line 9, we go ahead with the deletion process only if an item is selected. line 16, we show a Messagebox which prompts the user to confirm the deletion of the selected item. line 20, if user clicks "OK", our program proceeds to delete the selected item. line 23, we call BindUtils.postNotifyChange(String queueName, String queueScope, Object bean, String property) to update our inventory table. By giving the parameter queueScope a null value, the default desktop queue scope is used. The third and forth argument are given as such since we want to notify the Binder that property "items" in our InventoryVM instance has changed. 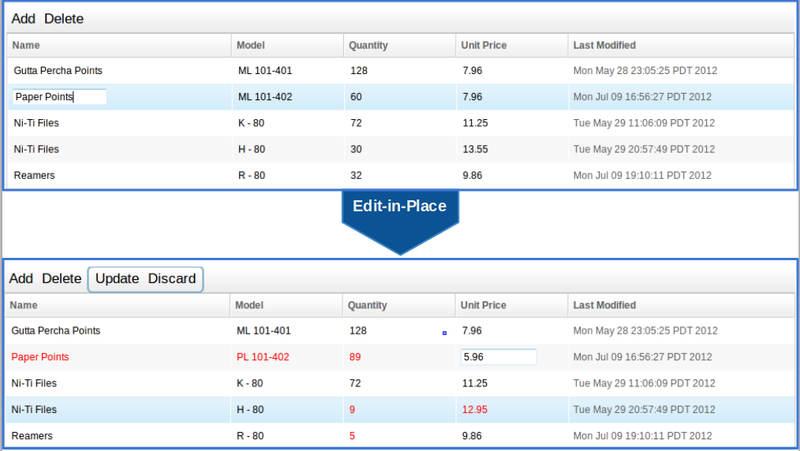 The Binder would then update the UI (remove the item entry in the inventory table). The @NotifyChange annotation lets us update the UI through ZK MVVM's Binder to reflect changes made to the ViewModel properties. The notification is fired when the annotated method finishes executing. In our implementation, we attached an anonymous event listener class to a Messagebox. In this case, after deleteItem is executed, the annotation @NotifyChange("items") would falsely alert the Binder before the event handling is completed. A programmatic way to reflect state changes in ViewModel to the UI resolves this particular problem conveniently. Next up, editing the entries with MVVM. This is the second episode in our efforts to build a ZK application from the ground up. 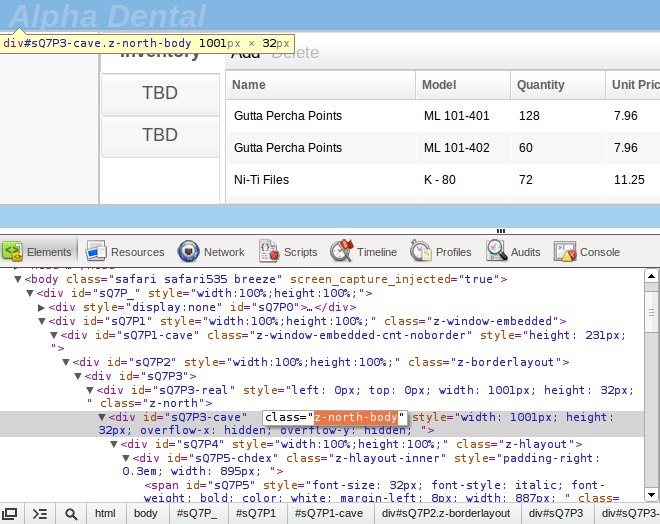 The previous post dealt with loading and rendering of data into a table using MVVM. In this post, we'll be introduced to ZK MVVM's form binding. We'll build an "Add" function that would enable us to save new entries to the inventory. Line 4, we declare an Item object named newItem which will reference the Item instance to be saved to the database. Line 6, @NotifyChange informs the binder to update the UI on the state of the associated ViewModel's property. In our UI markup shown below, at line 8, we have a Groupbox annotated with visible="@load(not empty vm.newItem), hence the Groupbox will become visible once createNewItem assigns an instance of Item to newItem. Simply put, @NotifyChange refreshes the UI with respect to the updates on ViewModel's properties. Line 7, we annotate the createNewItem method with @Command and in our UI markup shown below, at line 4, we have a Toolbarbutton with onClick="@commnad(createNewItem)". So when the Toolbarbutton is clicked, the createNewItem method will be invoked. Similarly, from line 12 to 18, we have a saveItem method which is called when its corresponding onClick event is triggered. Once the new Item object is saved to the database cache, we reset the newItem to null and retrieve the new list of items. The changes made to the ViewModel properties newItem (now null again) and items (now with an extra entry) are reflected to the UI using @NotifyChange as before. Line 1, we apply ZK's default implementation of its BindComposer. It is responsible for instantiating our ViewModel and Binder instances. Line 4, we assign our ViewModel's "command method" createNewItem as the onClick event handler for the toolbar button. Line 6, the property newItem in ViewModel is made referenceable throughout the Groupbox using the ID "itm". Line 6,7, by using form binding, to avoid invalid or incomplete data saved to the ViewModel property, entries in the form are saved to a temporary object until the command method saveItem is called. Line 8, we show the Groupbox to enter a new Item entry only user has clicked the "Add" button; which in turn invokes createNewItem method and assigns the VM property newItem an instance of Item with default value(empty strings and 0s). Line 14, 18, 22, 27, we bind the Item properties with the input elements. @bind is effectively equivalent to @load plus @save. Using form binding avoids directly modifying data in ViewModel properties by saving form entries to a temporary object. Data is written to the ViewModel properties only if the condition specified is satisfied; in our example, only if the saveItem method is invoked. @Command annotation allows the binder to map UI event handlers to ViewModel command methods. @NotifyChange informs the binder which ViewModel properties had been modified after the command method is executed so changes in data can then be reflected on the UI. We can assign values to any of UI components' attributes at run-time via MVVM binding to manipulate parameters such as visibility, style, disable/enable, etc. In this post, we've not seen how data entries are validated. Before that, we'll implement the delete and edit functionalities in the next post. In a previous post we've seen how the Ajax framework ZK adopts a CSS selector inspired Controller for wiring UI components in View and listening to their events. Under this ZK MVC pattern, the UI components in View need not to be bound to any Controller methods or data objects. The flexibility of using selector patterns as a mean to map View states and events to the Controller makes code more adaptive to change. MVVM approaches separation of concern in a reverse direction. Under this pattern, a View-Model and a binder mechanism take place of the Controller. The binder maps requests from View to action logic in View-Model and updates any value (data) on both sides, allowing the View-Model to be independent of any particular View. It also makes sense to expect that an item on the list can be selected and operated on. Thus based on our knowledge and assumptions so far, we can go ahead and implement the View-Model. Here we have a typical POJO for the View-Model implementation, data with their getters and setter. Let's elaborate a bit on the mark-up here. At line 1, we apply the default BindComposer to the Window component which makes all children components of the Window subject to the BindComposer's effect. On the following line, we instruct the BindComposer which View-Model class to instantiate and we give the View-Model instance an ID so we could make reference to it. Since we're loading a collection of data onto the Listbox, at line 3 we assign the property "inventory" of our View-Model instance, which is a collection of the Item objects, to Listbox's attribute "model". At line 12, we then make use of the model on our Template component. Template iterates its enclosed components according to the model it receives. 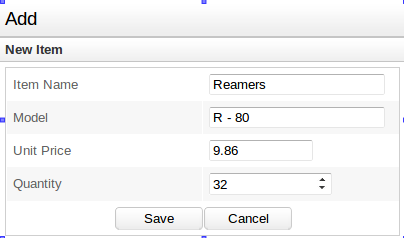 In this case, we have 5 list items which makes up a row in the Listbox. 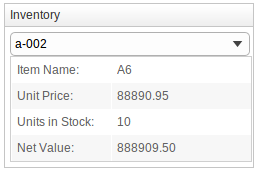 In each Listcell, we load the properties of each object and display them in Labels. Via ZK's binding system, we were able to access data in our View-Model instance and load them in View using annotations. At line 4, we load the data collection inventory to the Combobox's model attribute so it can iteratively display the ID for each Item object in the data model using the Template component declared on line 7. At line 12, we make the Listbox containing an Item's detail visible only if the selectedItem property in View-Model is not empty (selectedItem will remain empty until an item is selected in the Combobox). The selectedItem's properties are then loaded to fill out the Listbox. Under the MVVM pattern, our View-Model class exposes its data and methods to the binder; there's no reference made to any particular View component. The View implementations access data or invoke event handlers via the binder. In this post, we're only exposed to the fundamental workings of ZK's MVVM mechanisms. The binder is obviously not restricted to just loading data from the View-Model. In addition to saving data from View to ViewModel, we can also inject data converters and validators in the mix of View to View-Model communications. The MVVM pattern may also work in conjunction with the MVC model. That is, we can also wire components and listen to fired-events via the MVC Selector mechanism if we wish to do so. We'll dig into some of these topics at a later time. The variable y is not a local variable of getSum and yet it's been operated on within getSum. Closures are at work even for the most trivial code we'd write and take granted for. In the perspective of function x, var j and function y are accessible because they are declared within x, that is, they are local to x. 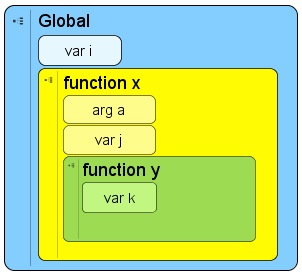 Function x cannot access var k since k is within function y, hence local to y, but not to x. So far, functions x and y's behaviour adheres to that determined by their respective scopes. However, by the merits of closure, functions can access variables outside of its local scope. Specifically, function y can access var j, and function x can access var i. A closure is formed for function y which preserves the environment which y was created in, allowing y continue to have access to that environment. The variable j and argument a (argument for function x) are two of the constituents in this environment. "A closure is a function together with a referencing environment for the non-local variables of that function." For ECMAScript, the proper name for this referencing environment 'e' is called an Activation Object when e is the local scope of a function, and a Global Object when e is the global scope. The activation object keeps local variables, named arguments, the arguments collection and this as key-value pairs. Every time a function is being executed, an internal object called Execution Context is created for that specific execution. Execution context keeps a list of all activation objects and global object for the respective function being executed. When a closure is not needed for a function to reference its non-local variables, the function's execution context is discarded along with its activation objects. However, since the inner function getSum references non-local variable z, and argument y, a closure is created. The closure makes a reference to the activation object for the "var getSumRef = setOperators(4)" execution context. Hence, even when setOperators' execution is completed, getSumRef remains to have access to the variables and the function getSum for evaluating the addition for us.